After pouring billions into its e-commerce infrastructure, the company's online sales growth continued to slow in the first quarter. The first quarter of 2016 was absolutely merciless to a lot of retailers. So when Wal-Mart (NYSE:WMT) reported earnings on May 19 that weren't downright awful, investors cheered and piled into its shares, sending the stock price up nearly 10%. Despite the bullish trading, there was one number that stuck out like a sore thumb in the earnings report: Wal-Mart's online sales grew just 7% year-over-year. In fact, last quarter marked Wal-Mart's ninth consecutive quarter of decelerating e-commerce sales growth. Additionally, the company underperformed the broader industry, which saw e-commerce increase over 15% year-over-year to account for nearly 8% of all retail sales. And while Wal-Mart is working off a larger sales base than most of its online competitors, the leading name in e-commerce, Amazon.com (NASDAQ:AMZN), saw its retail sales increase 27% in North America and 24% internationally during the first quarter as the company continues to gobble up online market share. Growth here is too slow. The U.S. number is better than the global number, but neither is as high as we'd like. We can see progress against several of the necessary capabilities we need to win in e-commerce, but we're still working on a few others. We need them all to come together to see stronger growth. However, the payoff of those investments has declined. 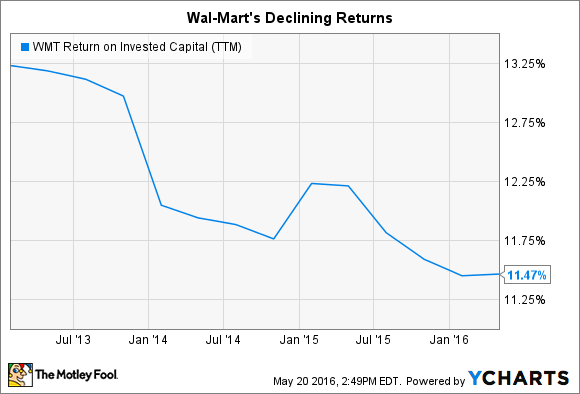 Wal-Mart's return on invested capital has fallen about 180 basis points since the beginning of 2013, when the company started redoubling its efforts in e-commerce. Combined with an increase in worker wages and the money it's spending to open new stores, Wal-Mart has seen a similar decline in operating income and earnings per share. The revenue growth from e-commerce just isn't enough to overcome the increased investment in the platform. As McMillan put it, "Growth here is too slow." The biggest opportunity for Wal-Mart in online sales is groceries. More than half of Wal-Mart's revenue comes from this category, which helped shield the company from the declines other retailers experienced during the first quarter. However, groceries have also been slow to move online.